Lab Zero Games made a name for themselves with 2012's Skullgirls as it quickly took the fighting game community by storm. 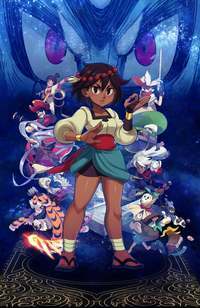 Now all these years later they look to make a similar splash into the RPG genre with their new game Indivisible. 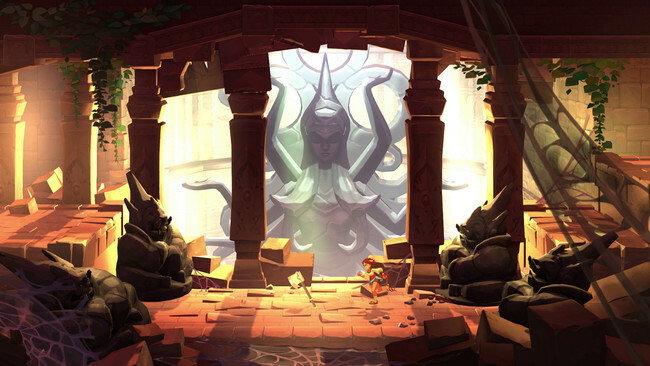 Featuring the same stunning animation work the studio is known for and a remarkably solid gameplay foundation, Indivisible looks to be a strong sophomore outing despite the fact that the team has never made a role-playing game before. At PAX West 2018, I was able to go hands-on with the action RPG and quickly realized that Lab Zero is creating something special yet again. Picture Valkyrie Profile and add wall jumping and you end up with the deliciously unique flavor Indivisible is going for. It's a side-scrolling adventure where you'll need to utilize tool axes to scale steep cliffs and cut through brush to get to where you need to go. The platforming is no joke and is on par with the likes of Mega Man in how it pushes you to execute frame-perfect movements. Side-scrolling is not just for set decoration in this game as items, power-ups, and even party members are tucked away in sections you can only get to by overcoming tough jumping puzzles. Though it won't brutalize you with bottomless or spiked pits, Lab Zero wants you to explore the environments they made and not punish you for not having decades of experience with action platformers. 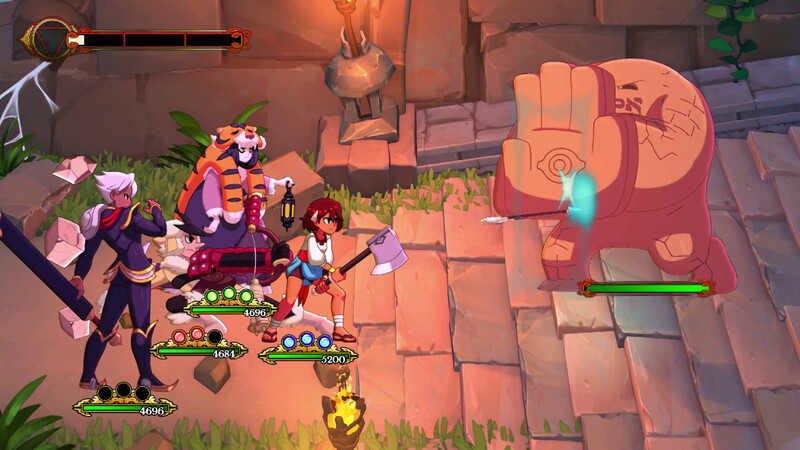 From at distance, Indivisible resembles an action platformer with its parkour-like gameplay and environmental hazards, but this is a full-blooded RPG. When encountering an enemy, your party will engage and a semi-turn-based battle will ensue. You can have four party members on screen at a time and each of them will have a button assigned to them for attacks, and each character will be able to execute two attacks before they go on cooldown. So, if you hit the X-button (the demo was played with a DualShock 4) twice, the character mapped to that button will run up to the enemy and get off two good strikes -- the same goes for each party member mapped to the other buttons on the controller. You can have party members attack one after the other giving a beat’em up combo-like feel to offensive actions. The circle button is reserved for blocking and an indicator will let you know which party member the enemy is after when their time to attack comes. These battles are very fast-paced, elegant, and there’s little downtime making engagements quite thrilling. Party members in Indivisible are met in an informal manner rather than in a grand cutscene or drawn out story segment. Sometimes you’ll just enter a room, and low and behold there’s a new party member there waiting for you. In my 20 minutes or so with the demo, I found something like 7 party members total. Each one had a distinct style in battle, and they can be swapped out and mapped to whichever button you wish. Indivisible is an absolute visual stunner, which is no surprise given Lab Zero’s work on Skullgirls. While the game appears 2D, it's actually 3D, but that works in its favor because backgrounds gain a certain sort of depth. It’s the sort of game that bursts at the seams with color, with lush green vines snaking their way down ancient stone structures. There’s a lived-in quality to the places you visit, and the world feels tangible. The animation is the real star of the show here though, especially with the character models. Every battle and platforming bit animates in a beautiful manner that evokes the style of a 2D feature film. I can’t imagine how many illustrated frames there are to each character, but it's clear the team delicately engineered each frame's artwork to prioritize fluidity and motion. There is a storyline in the game to be sure, but for the demo presentation of it, I wasn't able to devote a lot of attention to it. In my limited exposure, I found the dialogue charming and the characters likable, but for the sake of time, I opted to skip a lot of the narrative presented. While it's hard to judge the overall story from this, there’s a good number of cutscenes and the enjoyable banter between party members found here is definitely promising. Indivisible might be Lab Zeroes’ first stab at an RPG, but it was my favorite game of the show. It’s a feast for the eyes, has combat with a satisfying crunch to it, and platforming that encourages you to explore. Out of a crowded PAX lineup of upcoming games, this was the one that gave me the strongest ‘oh this is going to be something special’ feeling to it. I can’t wait to find out if that suspicion is true when Indivisible releases in 2019.